Image caption Nottingham Forest said the proposals would secure the City Ground as their "long-term home"
Nottingham Forest plans to increase the capacity of its ground to 38,000, making it the biggest in the East Midlands. The expansion is part of a major revamp of the City Ground, which includes constructing a new stand. Work could start by the end of the 2019-20 season. Owner Evangelos Marinakis said he wanted fans to "play an important role in the decision-making" when a public consultation starts. Forest, who have played at the City Ground since 1898, said there has not been any major development of the stadium for 25 years. 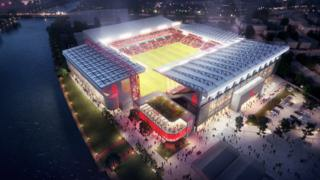 The club said it was "time for the new City Ground", as it announced plans to boost the current capacity of 30,000. Mr Marinakis said it was important to ensure the club's home remained on the banks of the River Trent, rather than relocating to a newly-built stadium. The club said an agreement had been reached with Nottingham City Council for an extended lease on the stadium, which would secure it as their "long-term home". "From the very beginning our strategy has been not to make promises but to deliver," added Mr Marinakis. A formal planning application will be submitted after a consultation period with fans and local residents. If approved, the work would see the main Peter Taylor stand out of action for two years. The stand is set to be rebuilt. The plans also include a new museum, a new club shop and hospitality lounges. There will also be an expansion of the concourse and improved disabled facilities around the stadium. Forest's stadium revamp would put the capacity of the City Ground ahead of Derby County's Pride Park Stadium, which has a capacity of 33,597, while Leicester City's King Power Stadium has 32,273.